Type your message, highlight any text you want to change, click the Font button in the IM text area, and then make your selections for font color, font type, and font size in the Font window. From the Lync main window, click the Options button , click General, then click Change Font. 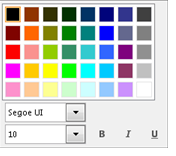 Select a default font color, font type, and font size. Then click OK. These selections will apply only to IM messages you send, not to those you receive. From the Lync main window, click the Options button , click General, click Change Font, and then select a color, font type, and font size. Then select the Apply settings to incoming messages check box, and then click OK. Tip: You can also increase the text size of any IM you are reading or writing. In the lower-right corner of the IM window, select the More button ( ), then select IM text display size and choose a magnification level.